What Do I Need To Do To Prepare My Home For Sale In Hua Hin? You have completed the check-list from Part 1 and are ready to list your home for sale! Next, you need to follow the check-list below for staging your home, both for professional marketing photos and for client viewings with potential buyers. At the same time, you need to prepare all your property documents in the event that you receive a sale offer so you can proceed quickly with the sale process. Follow the check-list below for tips on how best to prepare for these scenarios. 3. How do I stage my property for marketing photographs and for client viewings? What do I need to do during showings with potential buyers? Make sure your house is clean all the time. It’s not fun to live in a museum or a hermetically sealed lab, but if you’re motivated to sell your house, you need to make sure it’s show-worthy at all times, especially for when you receive those last-minute viewing requests because that could be your lucky buyer. We can’t stress enough how much the small details make a difference. If the big things are consistently maintained like keeping the floors, bathrooms and kitchen clean and tidy,—hire a regular maid while your home is on the sale market—it should be easier to keep the small things in check. No dirty dishes in the sink, no kitchen towels hanging off cabinets or on the counters; toilet seats (and lids) down; beds made nicely (don’t put the bolster pillows under the comforters – it looks like a dead body in the bed); and get rid of all the storage containers, garbage and clutter you’ve been accumulating for years. A clean and tidy house is the first, key point to staging your property successfully, and should be a relatively easy one to maintain. Consider adding some key decorative pieces to your home to make it stand out. Maybe it’s one large painting or wall feature that adds color, sophistication and atmosphere. Need some decorating ideas and inspiration? Check out www.houzz.com for millions of photos of different homes in different styles! 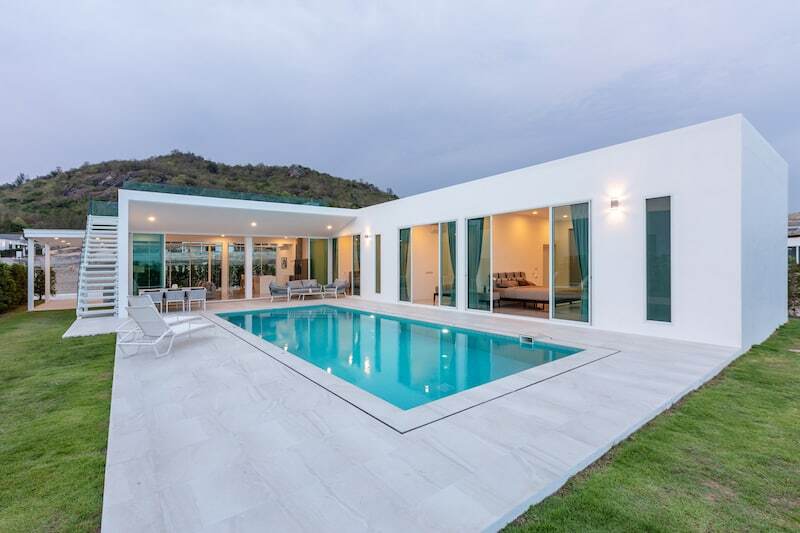 Most property buyers moving to Thailand are looking for a luxury home at an affordable price, or at least, the idea of a tropical oasis that they can’t find in their own country. That’s why they’re moving to Hua Hin in the first place: to achieve an affordable tropical lifestyle that is unattainable in their home countries. Some nice artwork and decorative pieces will enhance your property and provide a more inviting atmosphere for potential buyers. Right before your viewing, turn on all the lights and AC units around the house. Make your environment feel comfortable and inviting when your potential buyer enters the home. First impressions are everything in real estate. We understand that electricity is expensive in Thailand, but we promise you it will be worth the few baht to turn on the lights and air conditioning to make the home as inviting and comfortable as possible. This will encourage your potential buyers to stay longer in your property, and the longer they stay, the more likely it is that your home will become a viable purchase option for these clients. During the actual client viewing, we recommend that you are not present. If it’s not convenient or possible to actually leave the property, then at least make yourself scarce and stay out of the agent’s way. However, if you can, we recommend that you go for a walk or a drive and have the agent call you or send a message when they’ve left your home. The reason for this is that buyers need to imagine themselves living in your house. Most people feel uncomfortable when a seller is hovering around the house and following them through each room. Of course, we do not dispute the fact that you know your house better than everyone else, but if you have already given the property details to your agent, trust that your agent can do their job of selling your property to the potential buyer. You want buyers to feel comfortable and to stay as long as possible in your property. They need time to explore at their own pace, possibly open drawers & cabinets, poke around in spaces, all without feeling like they are intruding on someone else’s personal space. Remove most personal items reminding potential buyers that you live in the house. Remember that you are selling a fantasy to someone, and home buyers need to imagine themselves living in your house. If you have an awesome collection of football jerseys, teddy bears, toothbrushes, medication bottles, fill-in-the-blank-with-whatever-weird-or-marvellous-thing-you-collect, or a huge framed photo of your family or your wedding day, these should come down and be stowed away safely, ready for your move to your next new home. Replace the wall space with neutral artwork that will appeal to the largest majority of potential buyers. Do you have a dog? I bet your dog is adorable and practically perfect. I’m sure others feel this way, too. However, no matter how cute your animal may be, please make sure your pet is not present during home viewings. When a potential buyer comes to visit and tour your house, take your dog(s) for a walk. I can’t count how many times a client confided in me after a viewing that they felt uncomfortable because the dog(s) were threatening or even too friendly. Please remember that not everyone likes dogs, and that even though you know that your animal(s) is/are harmless, other people don’t know that. There have even been times when we can’t view a room in the house because all the dogs are locked in there. Obviously, a serious buyer needs to view the entire house and will want to do so without an animal lurking behind a closed door or following them around throughout the tour. And on a related note, if you have pets (and even if you don’t), get some air freshener. You can no longer smell the animals that live with you, but everyone else can, guaranteed. If you’re serious about selling your house, you’ll make your beloved pet scarce during all showings. Get rid of all your junk and de-clutter your house. Your home will show much better with significantly less stuff. The property will look cleaner, the rooms will look bigger, and the potential buyers will be able to imagine themselves (and their own junk) in your property without having the reminder that your stuff is already filling the home to the brim. Some people are pack rats. We’re not accusing anyone— that’s for you to reckon with yourself—but if you have anything more than a car parked in your carport you might want to consider de-cluttering your life and your home. If you haven’t used something in the last year, it’s time to get rid of it. Not only will your property show better to potential buyers, but you will also feel psychologically lighter and cleaner with a less cluttered home. Take that old throw blanket off your couch. Did you put that blanket there to hide all the stains? Try treating the root of the problem instead, which is either have your furniture professionally cleaned, or think about tossing your stained old couch and buying a new one. Again, the question comes down to how motivated are you to sell your property? Purchasing a new couch is a small price to pay for a full-price sale offer. The details really do count, and buyers notice when furniture is in good condition and also when it’s not. We recently had a client who purchased a brand new sofa for his living room; he sold the house within a few weeks of listing it for sale. We’re not saying the sofa sold the house for him, but it certainly didn’t hurt. Never show your house if your pool is dirty. This is a usually a warning sign to many buyers that the pool equipment is faulty. We understand that maybe your pool cleaner got the pH balance wrong, or perhaps there was a heavy rain the night before that clouded the water, but the potential buyer just sees a problem and pool problems can be expensive to fix, especially if it’s a large piece of equipment. If an agent has to start explaining issues and making excuses about the property from the get-go, you’re off to a bad start. We notice when some homes have no art on the walls, or a few night market trinkets placed around the house, but lack an inviting, charming atmosphere. Art appreciation is subjective & can be a very personal thing. If you don’t have a fine arts degree or don’t know how to buy the right art to complement your house, don’t worry, it’s difficult for most of us as well. I can’t stress the importance of removing large personal photographs (see above), but properties need some color on the walls or one or two centerpieces to make the space come alive. Maybe paintings or wall hangings aren’t your thing, that’s fine: a lot can be done with fresh flowers. Consider buying some orchid flower plants and place them as show pieces, the flowers last for weeks and look gorgeous. Get rid of the small, cluttered items, like the porcelain figurines you inherited from your grandma and dragged around the world with you. Replace a bunch of small things with one large, beautiful statement item that draws the eyes to a special area in your home that you’d like to show off. Sometimes less is more, but a little color makes a place looking inviting. If your home doesn’t get a lot of natural light, then you should pay special attention to de-cluttering your house. Dark homes generally feel smaller, so removing unnecessary furniture and knick knacks will make the space feel more cheerful, bright and welcoming. Do you have steel bars covering your windows & doors? Anytime we take a potential home buyer to view a house with steel bars covering the windows, the client always assumes the area is a dangerous place to live. If you believe that your home is more likely to sell to a foreigner, then remove all the security bars covering the doors & windows. Let’s be honest, they’re extremely ugly anyways and they make a house feel like a prison instead of a home. Steel bars covering your windows and doors will do nothing to help you sell your property. In fact, just the opposite and they will also make a home look low quality & uninviting. Speaking of welcoming potential Hua Hin property buyers and making them feel at home: a well-known trick employed by professional real estate agents and savvy sellers is to bake cookies or bread before a home viewing. The inviting aroma will trigger good memories, and the smell of fresh baked goods is guaranteed to stick in potential buyers’ minds. This will make your home stand out from the many, many, many properties they will view, and this is a great thing. Essentially, try to ensure that your property smells great. If you’re not a baker, at least buy a diffuser with scented oils (like the ones they use in spas) and turn it on 30 minutes before each viewing. 4. Finally, are all your important house documents—land title deed, building permit, house registration book, etc—ready to hand over to the buyer’s lawyer? Land title deed (Chanote, Nor Sor 3 Gor, etc). You should also know the difference between Chanote and Nor Sor 3 Gor: Chanote title deeds will have a red eagle at the top; Nor Sor 3 Gor usually has a green eagle. They are similar, but not the same. You’ll need several good quality photocopies of the front and back of your land title deed(s). Make sure to have good digital copies as well – in case you have to email them to a lawyer outside of Hua Hin. Once you have undertaken all of the above and organized all your property documents, you will be ready to list your Hua Hin home for sale. Good luck and let’s find the right buyer who will love your home just as much as you have!